For their latest limited release, Stockade has been doing some bridge building with the Brazilian brewery Dádiva. It stems from a friend-of-a-friend type introduction between the two breweries’ founders, where commonality extended right through to the nature of the way each brewery operates; both started as specialist contract brewers, making beer for others, before branching out and finding success with their own labels. Thus, a collaboration was almost inevitable. They opted to build their beer around passionfruit, a flavour that’s common to both countries but in a distinct way. For the Brazilians it’s a native fruit, for the Aussies it’s the most prominent character in the superstar Galaxy hop. As a result of both being added, the beer is a total passionfruit-fest, from aroma to the palate. Sure, there are a couple of other types of Aussie hops in there which offer subtle fruit notes such as that of peach, but it’s the character born on the vines and bines that shines. It’s a light bodied beer and drinks very easily, though being so fruity it naturally tends towards the sweet side; while it’s labelled a Session IPA, don’t expect to find the same level of bitterness that features in more prominent examples of the style. 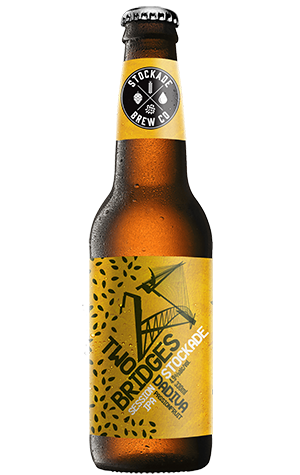 As for the name, Two Bridges, it comes from the two famous (or infamous) bridges in the breweries’ respective homes of São Paolo and Sydney which now bring the two cities a little closer together, all in the name of beer.